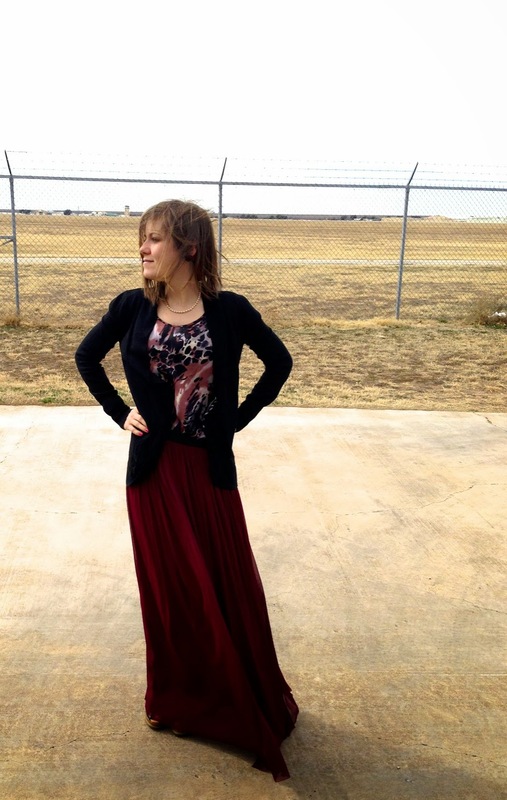 I have such a thing for romantic, flowy maxi skirts. When I find one on sale, I almost always cave. This skirt was originally a dress with a corset style tube top attached. I knew that 1) I'm not 16 and 2) I would never wear it like that, so with a closer look, I realized the top corset part was only attached by one thread. All it took was a little seam ripping and strategic cutting around the zipper, and voila! $5 sale rack X3 different colors later, I had elegant elastic waist maxi skirts in deep burgundy, pale pink, and black in minutes. Do you have an item of clothing that you just can't say no to when you find a great deal? Unfortunately, mine seems to be just about everything. Sale racks are my weakness. That skirt is so cute!! Way to make something awesome out of something that (sounds like it) was once hideous! I love your outfit. You are so creative to think to turn the dress into a skirt. I have a maxi skirt in that same color and I love it. Although mine is cheap and little thin. Oh well. It's such a fun color to match with other things.